It’s tempting to dismiss Brat out of hand before you’ve even laid eyes on the place. It’s situated above the newly relocated Smoking Goat in Shoreditch, which makes it sound like the hospitality equivalent of a grubby bedsit or a suffocating flatshare. The kitchen is headed up by Tomos Parry, formerly of the lauded Kitty Fisher’s in Mayfair, but that fact will bore the majority of humanity that doesn’t obsessively follow the comings and goings of London’s restaurant scene. Once I walked past the backlit wine cabinets that pass for a reception and climbed the stairs though, I was pleasantly surprised by how grown-up Brat (allegedly the Basque word for turbot) feels in the flesh. The handsome wood paneled interior feels classy and relaxed with no ostentatious interior design gimmickery in sight. Service was calm and measured, even when the place is heaving, but also friendly without being overly matey. None of these things should be remarkable, but they are in a market that often seems to favour shallow frippery over the fundamentals. The predominately carnivorous and pescatarian menu will seem uninteresting to the casual observer. Don’t be that casual observer. Anchovy bread doesn’t use anything so pedestrian as sliced white or breadsticks, but a remarkable golden disc of focaccia-like glory. Fluffy, puffy and softer than my arse cheeks slapped red and raw, it was a remarkable feat of baking. 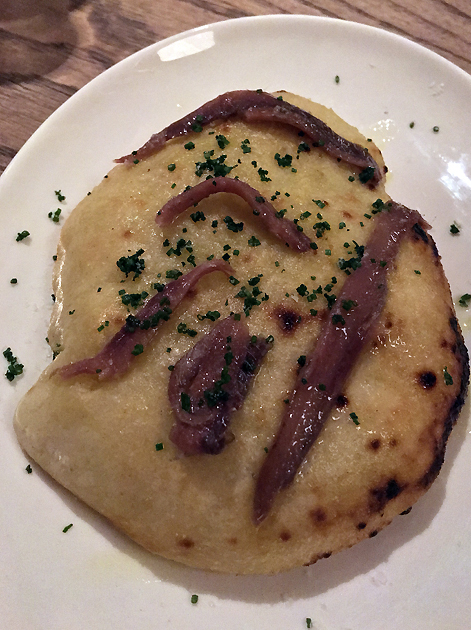 So much so that it easily outclassed the little anchovies laid on top of it. While the fishes did have a salty tang, it wasn’t anywhere as boldly distinctive as the Cantabrian anchovies often available at Terroirs. Rabbit arrived in the unexpected form of American-style breakfast ‘sausage’ patties. While enjoyable in their own right with a light meatiness and modest umami, it seems almost wasteful to have made them using rabbit – a meat where much of the appeal is its firm texture. Creamy soft beans and a bready but otherwise surprisingly muted black pudding provided the backup. There’s a beast of a dish just waiting to be unleashed here, but it’s not quite there with the kitchen fumbling the keys to the cage. Did they kill the rabbit with a Holy Hand Grenade? Clams in liver sauce isn’t a combination I’ve ever seen before. 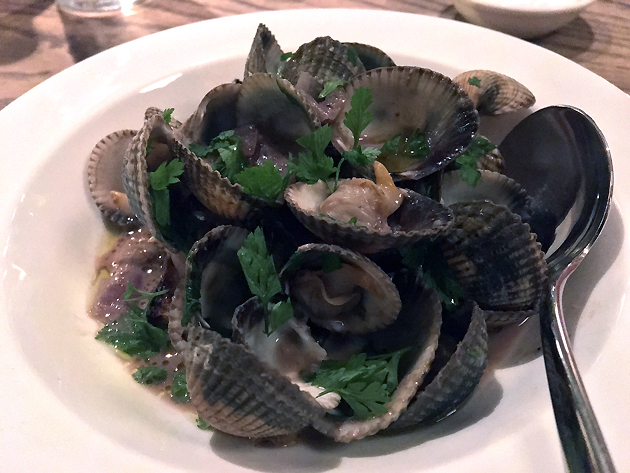 The fleshy little clams went well with the offaly sauce, but the latter only developed its lip-smacking herby umami late in the game. A late bloomer with potential. A piece of bread was placed at the bottom of the bowl, soaking up excess sauce to ensure that not one drop was wasted. 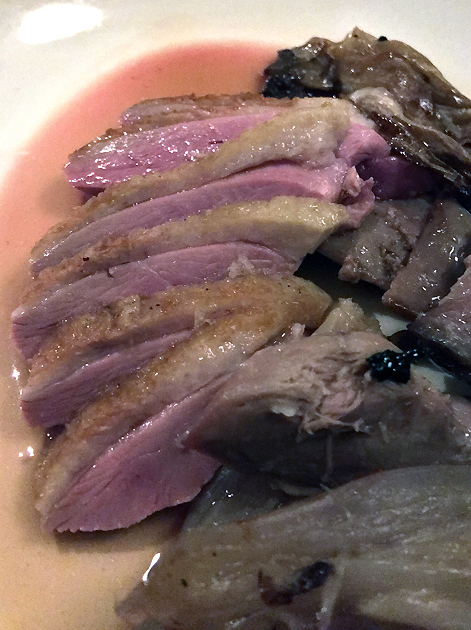 Slices of duck had soft, sensibly seasoned skin. Each slice was, without fail, remarkably tender and blessed with a subtle sweetness. Funky offaly bits and bitter leaves neatly provided some sharp contrast to the quietly accomplished duck. The sweet grapes on the side were an odd choice. 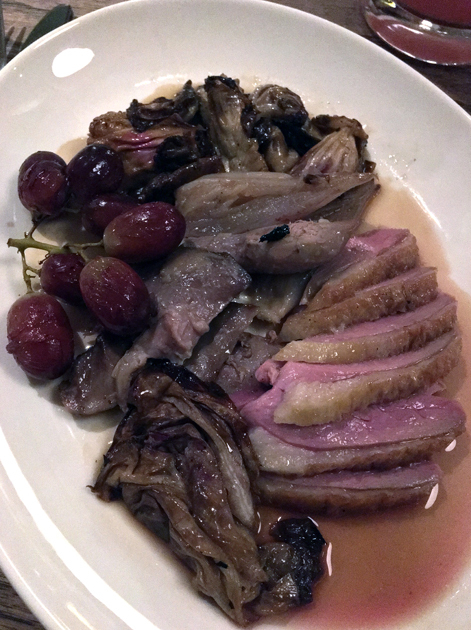 They didn’t obscure the naturally subtle sweetness of the duck, but neither did they contrast with it either. Don’t duck out of this opportunity. While the squidgy, fluffy cheesecake was texturally superb with delightful custardy and eggy notes, it was also a bit too sugary sweet for my liking. 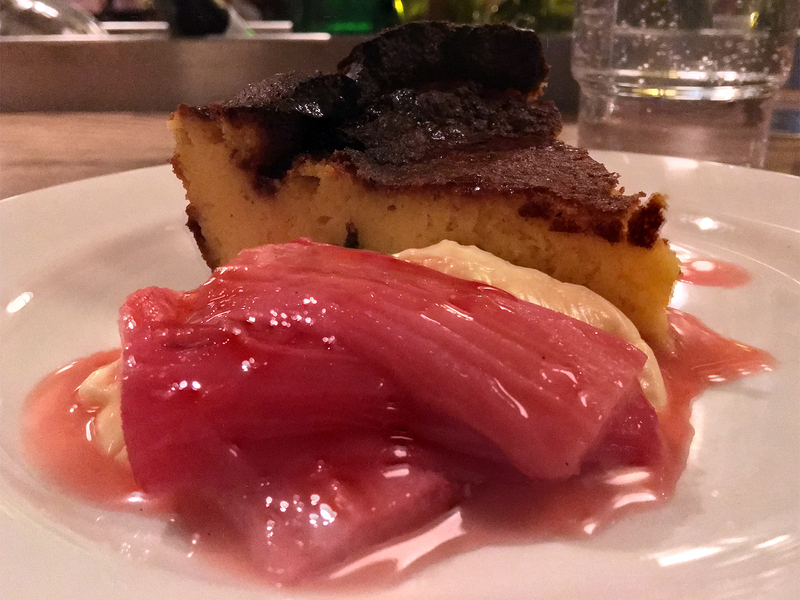 Not even the overly softened rhubarb or underwhelming crème fraiche could do much to counteract it. Smoked cod’s roe looked, quite unexpectedly, like soldiers made from an egg and cress sandwich. It tasted like it too, but in a good way with the bold and striking taste of the roe shining through with an unsurprising resemblance to smoked salmon. Behold! An egg, cress and smoked salmon sandwich reimagined! 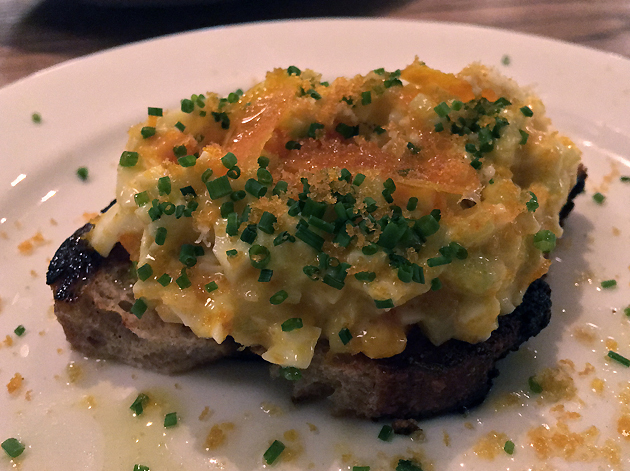 The superlative nature of the smoked cod’s roe makes the similar chopped egg salad with bottarga all the more befuddling. Made with similar ingredients and yet not anywhere as flavoursome, I wouldn’t be surprised if this dish was quickly and quietly dropped. 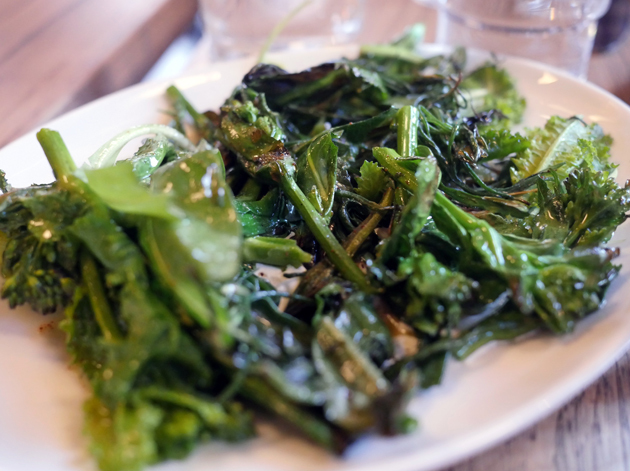 To be fair this ‘salad’ did have a somewhat different mouthfeel (of finely chopped egg – surprise! ), but that’s not nearly enough. 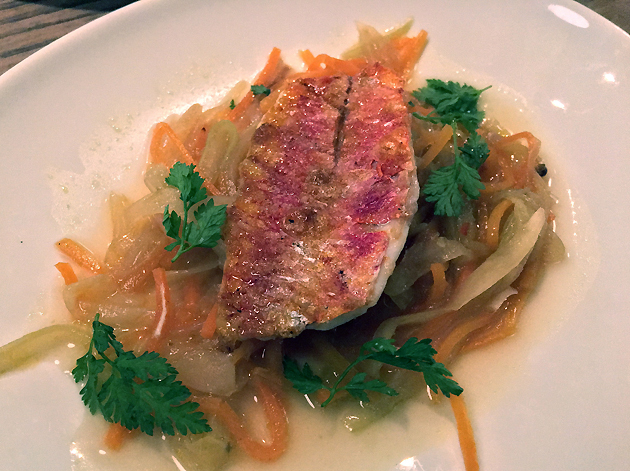 Soused red mullet was remarkable from start to finish. 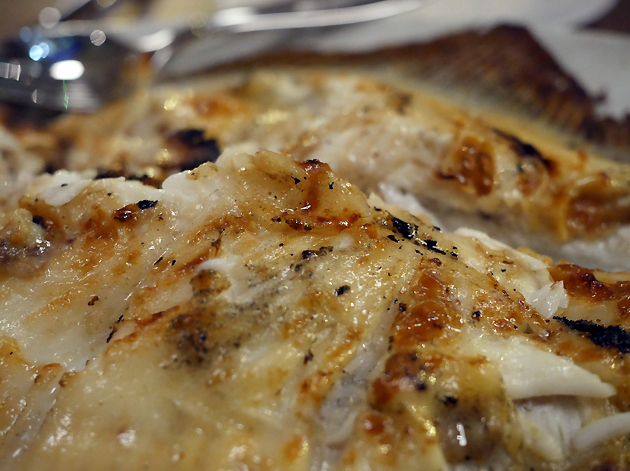 The fish, cooked just-so, was meaty yet light. Salty and umami, yet not overpoweringly so. Tinted with a light smokiness, this was a subtle and nuanced bit of fish aptly complimented by tart and zesty sauerkraut-like veg. Soused mullet, not Scouse mullet. Lamb medallions were tender enough to be cut with minimal effort, but this was far from the most remarkable thing about this dish. The noticeable but not overpowering earthy funk neatly segued into a gentle unctuousness with hints of umami and a sweet undercurrent. Such nuanced, complex layering of flavours make this one of the most remarkable lamb dishes I have ever eaten. And that’s without the extra cut of fatty, offaly and crispy flesh on the side or the smoky, charred leeks and bitter leaves providing apt back up. It’s easily a contender for dish of the year and it’s only barely April. 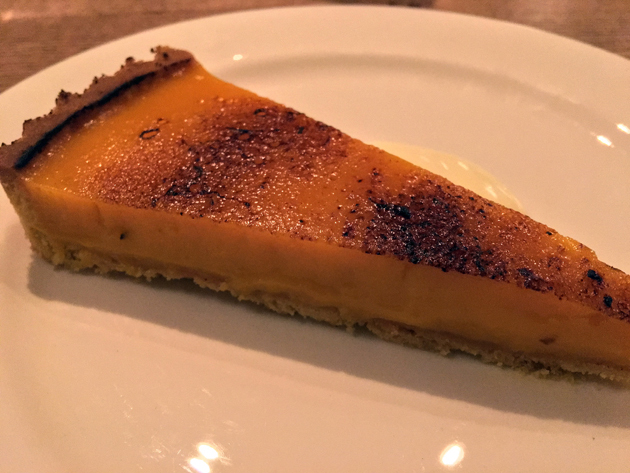 A slice of lemon tart with an attractively burnt crust wasn’t anywhere as zesty and tangy as I expected. And yet I was still taken in by its charms, from the thin, golden crust that was moreish and not too sweet to the mellow citron-like sweet sourness of the filling. Perhaps not all lemon tarts have to be turned up to 11 after all. Even the crème fraiche was better this time around. Even if every London restauranteur and their granny wasn’t baking their own bread and churning their own butter, it would be a grave mistake to skip Brat’s carb and lactate offering. 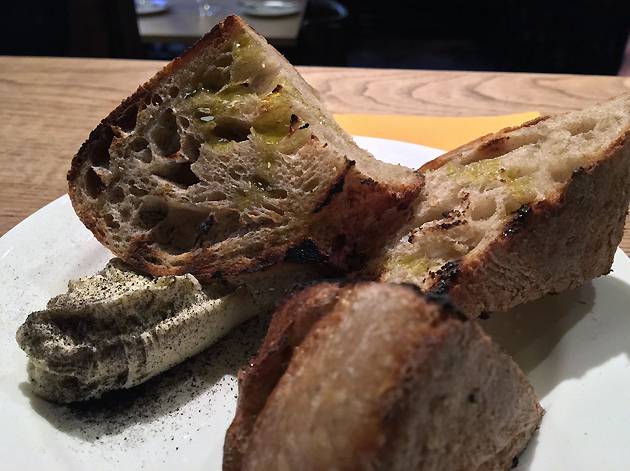 Soft bread with a crust that tore apart with a satisfying crunch was satisfying enough on its own. It was even better with the butter, although that term hardly does this speckled black-and-white manna justice. Light almost to the point of weightlessness, yet brimming with a rounded lactic tang and an etheral moreishness that dissipated almost as soon as it hit the tongue. Perhaps none of it is made in-house and is instead nicked from the neighbouring Lyle’s which also serves a bread and butter of uncommon distinction. It doesn’t matter. Order it. Devour it. Savour it. Bread and butter is better at Brat. 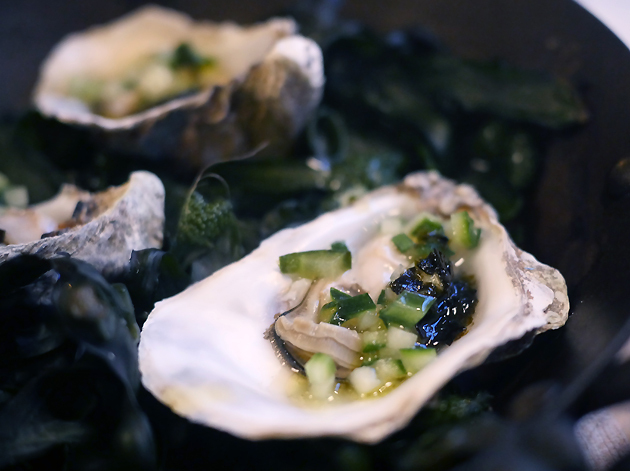 Oysters with roasted seaweed sounds like such an obvious combination, yet it remains an uncommon pairing. 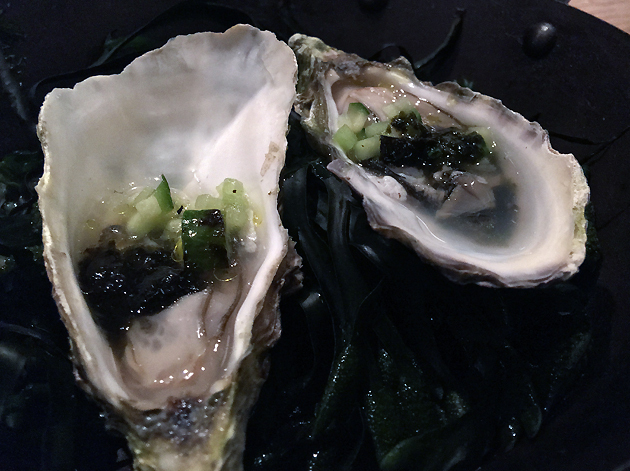 The bulbously fleshy oysters had a rich butteriness balanced out by a rounded briney sweetness with an unsurprisingly dashi-like umami underlying it all. This is the stuff that deathbed meals are made of. The beef chop is available in a choice of sizes, depending on either the size of your party or your death wish – the smallest portion comes in at approximately half a kilo. 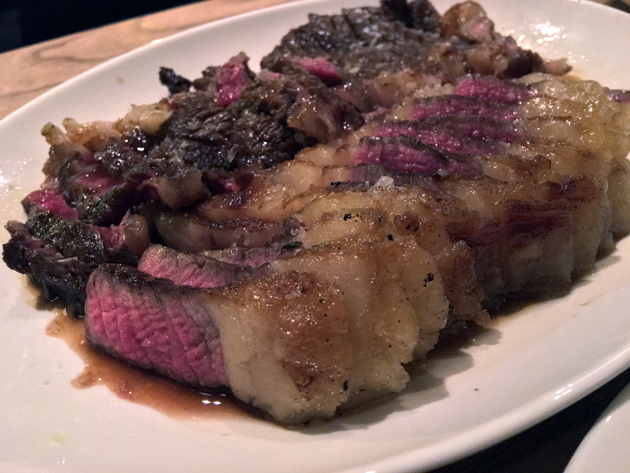 It was an undoubtedly well-prepared, well-presented hunk of beef with a neatly browned exterior and a royal purple interior with some slices crowned with shimmering, quivering fat. But, enjoyable as it was, its plain jane lack of character meant it just couldn’t compare to the far more intricately flavoured duck and lamb. Possibly cut from the rump. Ruby segments of ribbed tomatoes were rich with umami and a gentle sweetness. This shouldn’t be remarkable, but it very much is in an age of supermarket tomatoes that taste of nothing more than damp disappointment and icy ignominy. I would apologise for forgetting to take a photo of the tomatoes, but you know what tomatoes look like. 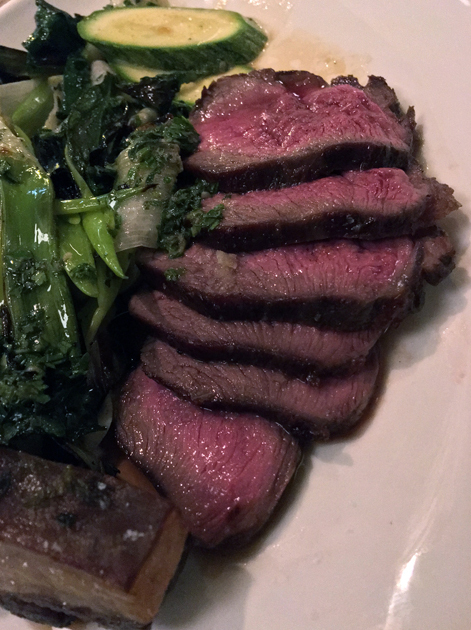 The charred, smoky, bitter leeks that accompanied the lamb made a repeat appearance. This side dish wasn’t only reliant on the leek’s ample charms though. 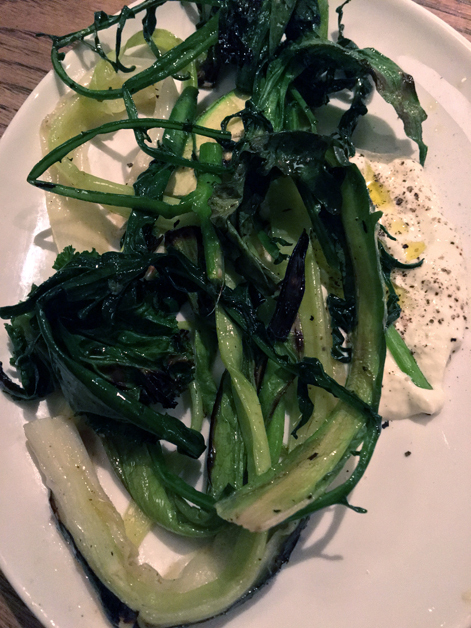 The whippy stracciatella cheese sitting underneath the leeks had a remarkable milkiness and salty tang, akin to a burrata. Simultaneously simple and sophisticated. Cheese and leeks. Cheeks, if you will. But I think that one is already taken. 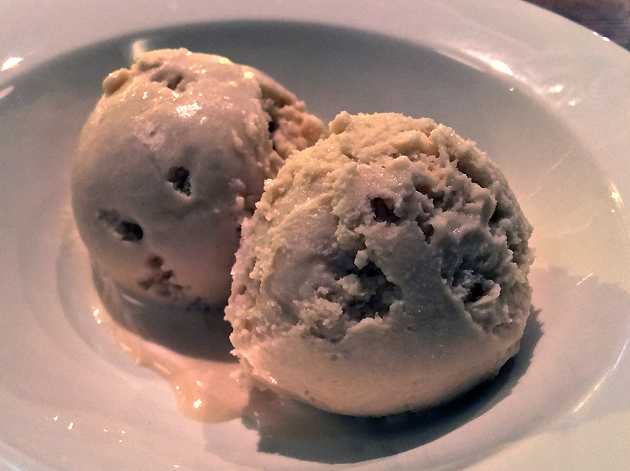 The name ‘brown bread’ ice cream almost doesn’t do this dessert justice. Its savoury maltiness and gentle brown sugar-like sweetness was not only evocative of brown bread without crossing over into parody, but also perfectly at home in the two bracingly cold dollops of smooth refreshment. Only the inconsequential squirt of marmalade at the bottom of the bowl was a let-down and a very minor one at that. Gold does not always glitter. The oysters were almost as sumptuous as they had been the first time around, let down only by their rather thin and limp mouthfeel. Variation is inevitable in a catch, but this fact didn’t make the disappointment any less palpable. London is your oyster. Don’t eat in the same ol’ places. The leeks, on the other hand, weren’t just as good as they had been before – they were even better. Although less charred this time, the leeks were still resplendent in all their nuanced and complex smoky bitterness. The stracciatella cheese wasn’t as salty as it had been, but it still had plenty of refreshingly milky burrata-like charm to it. This pairing feels so natural and inevitable, it’s almost as if these leeks was destined to be eaten with this cheese. Langoustine hashtag chasers everywhere should piss off and let the rest of us savour Brat’s rendition of these crustaceans in peace. 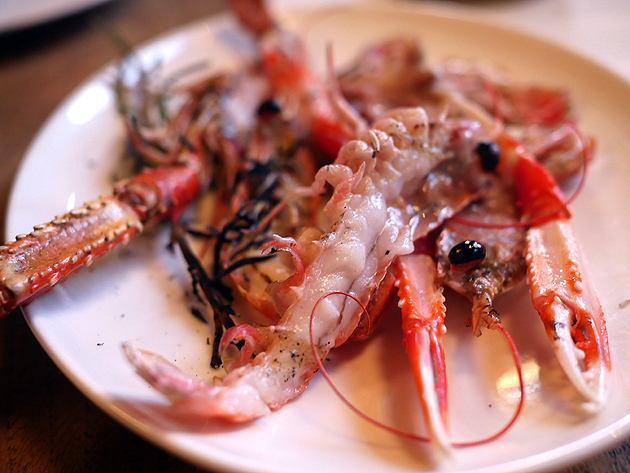 Although the little swimmers in this catch were on the scrawny side, their quiveringly delicate red prawn-like texture and juiciness infused with a profound smokiness more than made up for this. I don’t think I’ve ever come across this particular taste-texture tango before and it’s a delight that should be savoured for the singular wonder that it is. Kangaroo Face and I were divided when it came to the two soups in our meal. Kangaroo Face favoured the pea and ham soup. 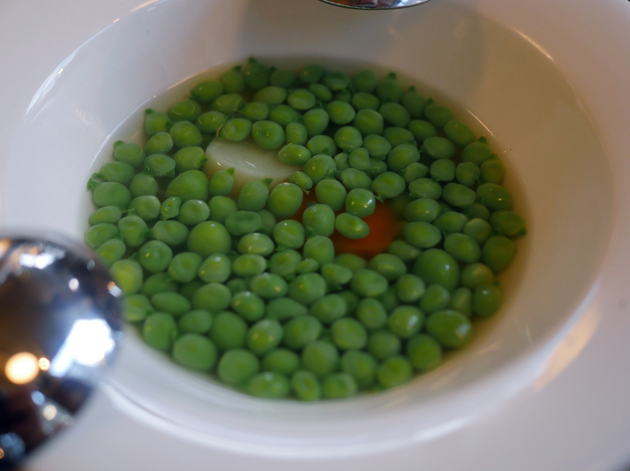 While far from bad, there wasn’t much to it once I had taken in the springy firmness of the peas – the soup itself was far too subtle for its own good, especially when served after powerfully flavoursome blockbusters such as the cheese and leeks. Pease pottage it is not. 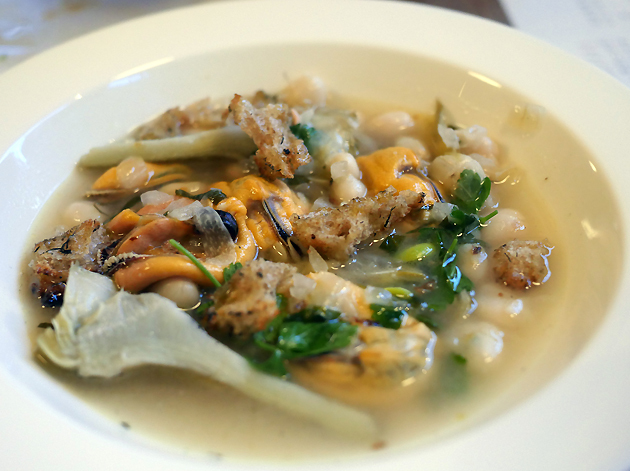 I was far more taken with the parlsey-infused fleshy molluscs bobbing about in the mussel soup. Although neither Kangaroo Face nor I were especially keen on the soaked bits of bread, the briney sweet bits of onion neatly rounded out this eminently slurpable soup. We were both in agreement that the beef tartar was a missed opportunity. While the paprika-like heat was modest, it was still enjoyable enough. 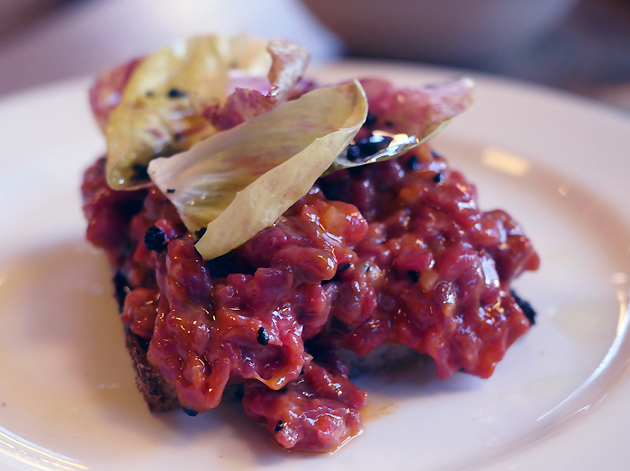 The excessively soft texture of the raw beef meant that there was little in the way of mouthfeel though – a critical failing in a steak tartar as far as I’m concerned. The crunchy toast only served to emphasise this lack of meaty texture. 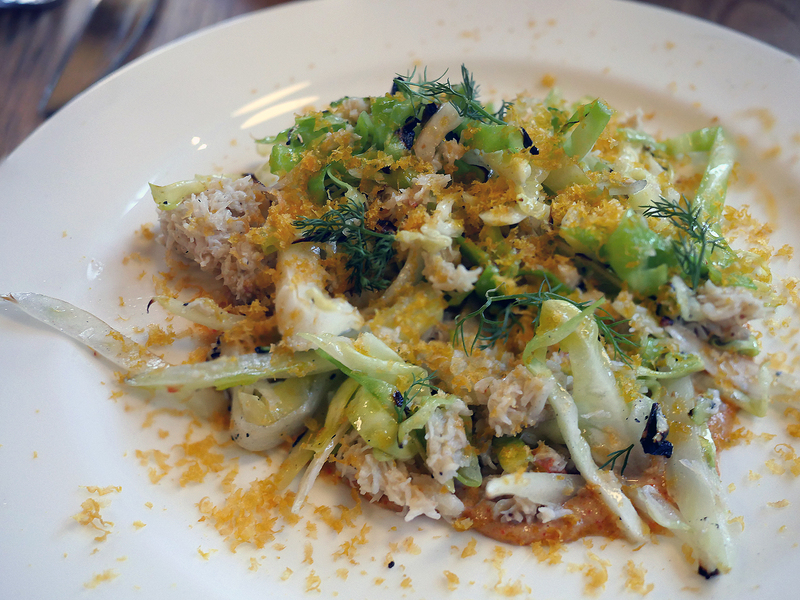 I was unmoved by the flaked spider crab, with the promised cabbage and fennel providing little more than dead weight. The red-brown sauce, almost certainly made with crab head gunk, added a touch of moreishness but not enough. 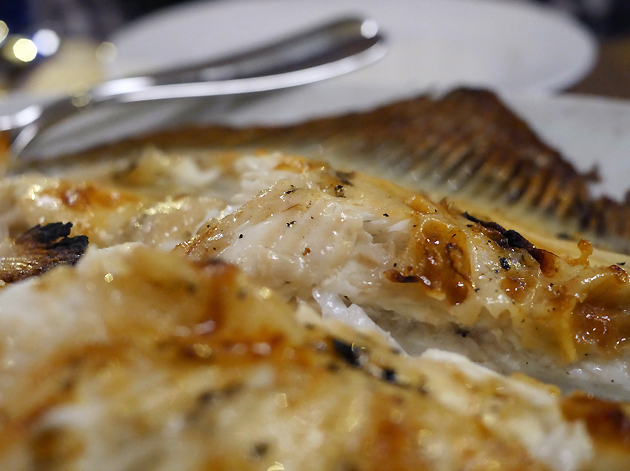 Brat’s eponymous dish is certainly a whopper – the smallest whole turbot here weighs in at over a kilogram. This, along with its high price starting at £55 (which is actually very reasonable given current market prices), may well explain its apparent unpopularity judging from my eyeball surveys across four visits. It’s an occasional treat, but one that’s well worth indulging in. The light and pearlescent yet meaty fillets and flakes of fish flesh were simply exquisite. Roasted just-so, it was a delight whether taken with the umami of the sticky sauce and skin or not. Don’t forget the cheek – a little denser and tauter than the rest of the turbot, it’s qualities are subtle but still worth fighting for. Turbot Charged. Yup, I nicked that pun and I used it twice. Sometimes, I don’t know how I sleep at night. You’d struggle to fin-ish this on your own. 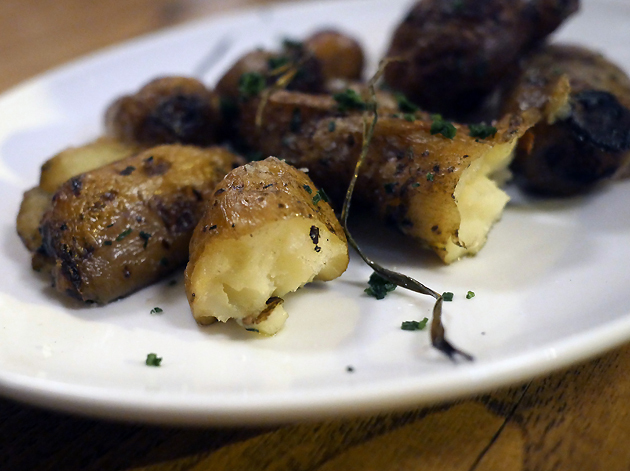 Although the titular quality of the smoked potatoes reared its head too late in the game to leave much of an impression, the hit of rosemary meant these tender tubers were still a worthy accompaniment to the turbot. This review’s procrastination was brought to you, in part, by A-Ha. The brown bread ice cream was a smash hit yet again, this time with a bit more marmalade. This shot was taken on a dedicated camera. 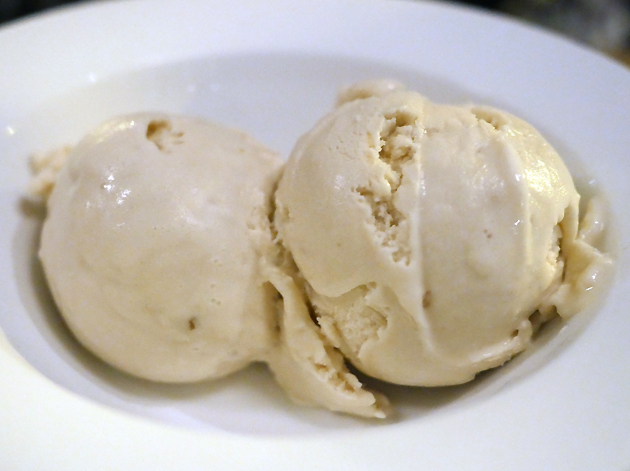 The previous shot of brown bread ice cream was taken on a recent-vintage smartphone. This is why I still shoot on a dedicated camera when I can. Although there was a hint of bittersweetness in the chocolate ice cream, there wasn’t enough of it. 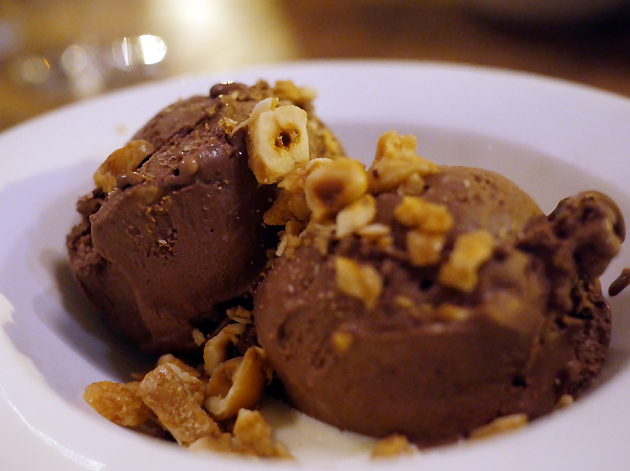 While still nonetheless smooth and refreshing, the flavour in this dessert was to be found in the crunchy hazelnuts scattered on top of the ice cream rather than in the ice cream itself. Now I have a hankering for hazelnut ice cream. I don’t drink booze, but Kangaroo Face does and can do so for the both of us and then some. He was surprised by the selection of sherries, especially as they could be ordered by the bottle, when drinking any sherry – let alone a whole bottle of the stuff – is apparently quite uncommon for anyone born after the Napoleonic Wars. The Equipo Navazos, Fino En Rama ‘Saca de Junio’ 2017 was particularly winsome. 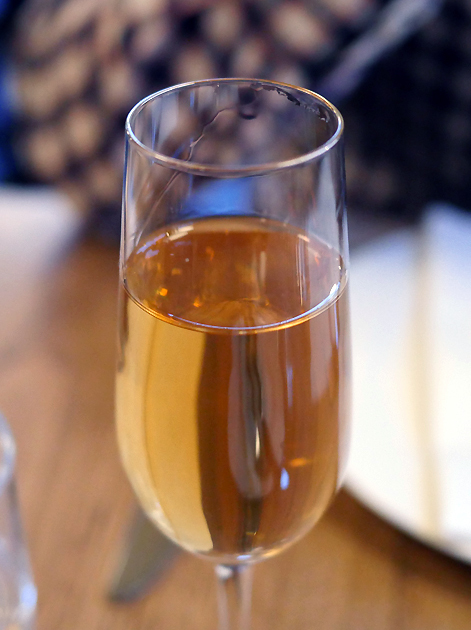 The extensive wine list has plenty available by the glass at £10 or less, with most bottles starting at around £30-ish. 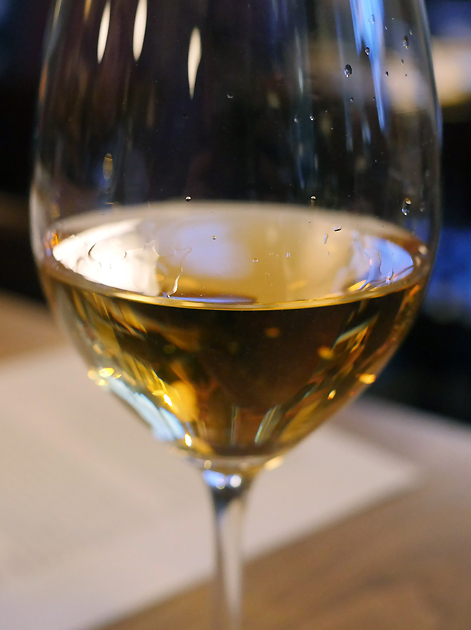 He was impressed by the exclusively Old World selection of wines, with the shimmering golden sheen of the 12 year old Spanish white Lopez de Heredia eliciting an appreciative smile. A bronze Spanish Maestro Sierra PX sweet wine garnered a whimsy-filled tilt of the head from my dining companion. Unsurprisingly, the full wine list is several times longer than the food menu. If you can have vegetarian restaurant reviewers, then a teetotal restaurant reviewer doesn’t seem that outlandish either, eh? It’s easy to underestimate Brat, with its lack of gimmickry and flashiness. Yet, it’s also just as easy to overestimate the place judging from the other, more over-excitable reviews out there. 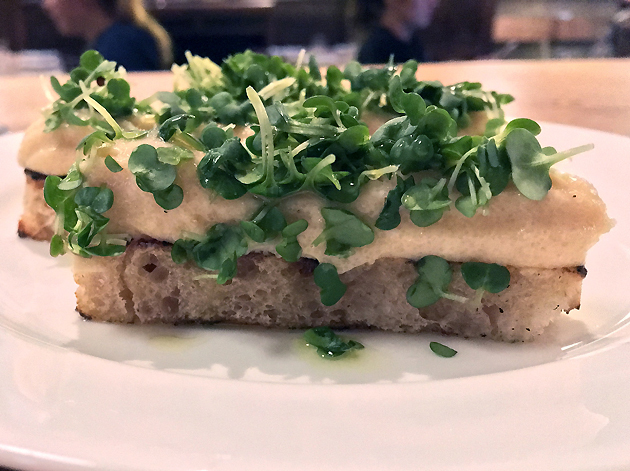 If everything was as profoundly satisfying and brain-ticklingly deep as as the turbot, duck and lamb, or at least as neatly comforting as the desserts, then Brat would easily earn a laurel crown. 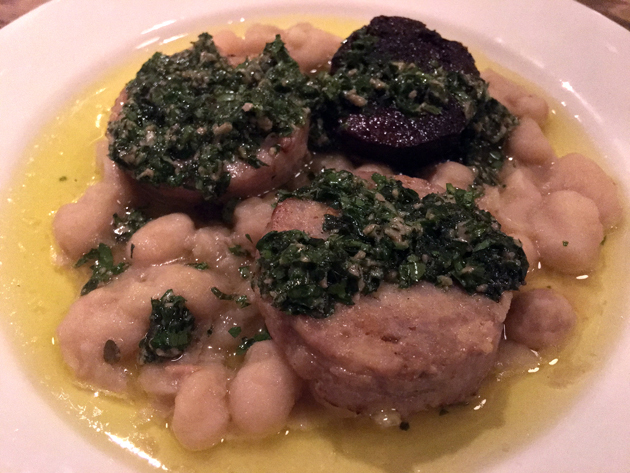 As it is, far too many of the smaller dishes were surprisingly rough around the edges. Then there’s the pacing, with a surprisingly long intermission between the smaller dishes and the bigger, meatier plates. And while the turbot and beef chop are designed for group feasting, all that lovely unadorned wood meant that the noise built up to the point where I sometimes struggled to clearly hear the person sitting across from me. Attempting to talk to someone at the other end of a long table would likely prove impossible. It’s at times like these that I almost wish I gave half-star ratings. As it is, Brat just about squeaks it in with a Four Star rating. Not because it’s perfect with something for everyone, no matter the occasion or the size of your party. But because it’s an eminently classy retreat in which to hide away from the world for a few hours, safe in the company of expertly chosen, exquisitely well-prepared red meat and seafood. If that’s not worth applauding, then I don’t know what is. Opening Hours: Tuesday-Wednesday noon-15.00 and 18.00-22.00. Thursday-Saturday noon-15.00 and 18.00-23.00. Sunday 13.00-17.00. Closed Monday. Average cost for one person including soft drinks and service charge: £50 approx. £90 approx. 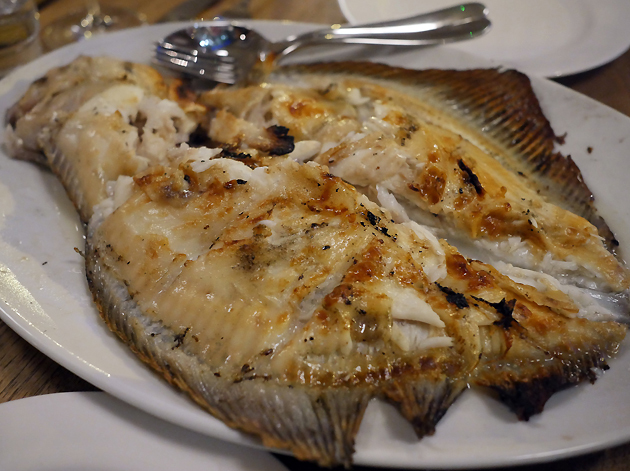 if you treat yourself with the turbot or beef chop, plus some booze. Tags: anchovies, beef, black pudding, brat, bread, butter, cheesecake, chocolate, clams, crab, duck, egg, fish, ham, ice cream, lamb, langoustine, langoustines, leeks, lemon, liver, london, mullet, mussels, oysters, peas, potatoes, rabbit, restaurant, review, rhubarb, roe, salad, seaweed, shoreditch, soup, steak, steak tartare, tart, turbot. Bookmark the permalink.